The China-UK “golden-age” in education is showing little sign of slowing down, with the number of British independent school branches in China expected to increase by nearly 50% in 2019, a report by Venture Education has shown. 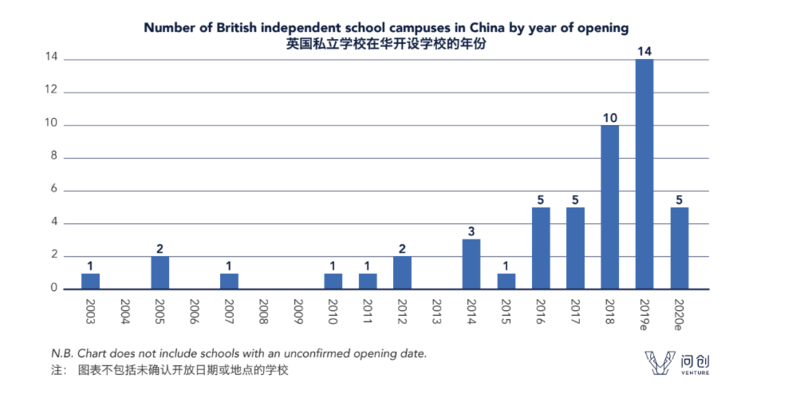 According to the ‘British Independent Schools in China: Annual Report 2019’, despite growing fears of China’s economic slowdown, 2019 will see a record 14 British independent school branches opening across the country. These will include The King’s School, Canterbury, which holds the record as the oldest continuously operating school and Shrewsbury School; one of the UK’s original seven public schools which counts Charles Darwin amongst its alumni. The report shows that at the end of 2017 there were 22 British independent school campuses operating in China. This number is expected to have more than doubled by the end of 2019, with 10 new campuses in 2018 and a further 14 openings planned in 2019. In addition, the number of British independent school brands with at least one branch in China is expected to increase by 64% in 2019. Some of the reasons cited for the surge in school numbers include China and the UK’s ‘golden-age’ of relations in trade, while British independent schools with a recognised name have a strong appeal to Chinese students looking to study abroad in the UK. Overall, the report continues, the international school market in China has gone from strength to strength and 2018 alone saw the opening of 87 new international schools across the country, bringing the total to 821. “Among these schools, the British curriculum is the most commonly used, with 40% of schools offering an A-Level curriculum, ahead of the USA’s AP (26%) and the International Baccalaureate (15%),” it notes. According to the report, private schools that admit Chinese nationals made up more than half of all international schools for the first time in 2018 at 52%, compared to private schools open to foreign nationals only (15%) and international departments in public schools (33%). Last year, the report continued, Shenzhen, Fuzhou, Xuzhou and Wuxi all saw their first British independent school campuses as will the cities of Nanjing, Guangzhou, Chongqing, Hefei and Foshan in 2019. Speaking about the findings, senior partner of Venture Education Julian Fisher described the “incredible growth” of British independent schools in China as a sign that British education is seen as the gold standard at K-13 in China. “British schools bring experience, expertise and innovation to a country that is looking for a holistic education that inspires the next generation,” he added. The real challenge, Fisher continued, will be recruiting students, recruiting quality teachers and maintaining international standards of quality. “This is where support from the home schools, international associations such as COBIS and ACAMIS, the British government’s Department for International Trade and the British Chamber of Commerce in China will increasingly have a role to play. “The golden age of UK-China relations is truly at its strongest in education,” he said.